An overview of our business and expected operating environment for the next 5 years. 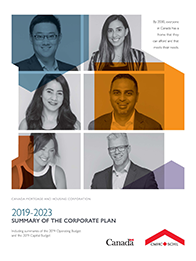 Our Summary of the Corporate Plan presents our priorities, initiatives, key performance measures and financial plan for the next 5 years. We are accountable to Parliament through the Minister for CMHC, currently the Minister of Families, Children and Social Development. We report on progress against our plan though our quarterly financial reports and our annual reports. This summary reflects our new Housing Affordability Strategy, which drives towards one clear aspirational goal: By 2030, everyone in Canada has a home that they can afford and that meets their needs.